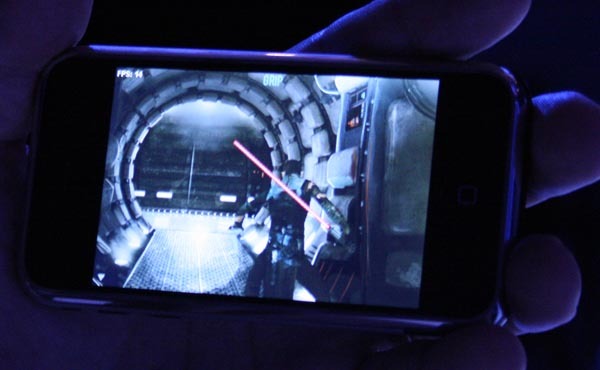 Reporting from E3, Gizmodo was shown a demo of Star Wars: The Force Unleashed running on the iPhone. Force Unleashed really is a pretty game. Crystal clear 2D backdrops give the levels a lot of pizazz despite that they are, you know, 2D. And light sabers glow properly on the screen. The Force Unleashed is a video game coming for multiple platforms including the PlayStation 3, Xbox 360, Wii as well as the PSP, Nintendo DS and N-Gage. Gizmodo wasn’t that impressed by the gameplay, however, as the game does not appear to utilize the iPhone’s accelermeters. Gameplay is described as a combination of deflecting laser shots and activating force powers by using a touch gestures. Regardless, the game is expected this September. Update: Crunchgear has video of the gameplay on the iPhone.